It's my turn to host an Island Collection giveaway! Jane Richmond designed five perfect knits inspired by her home of Vancouver Island, then with the help of her BFF and her photographer brother they took those five patterns and turned them into a beautiful, inspirational book. 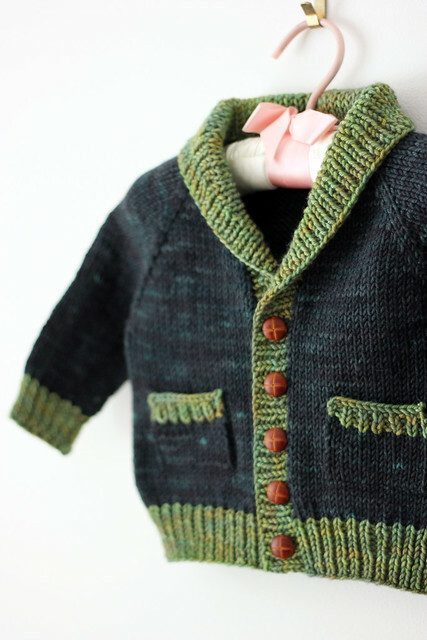 The book was released only a few short months ago, but there are already loads of gorgeous projects showing up on ravelry. For me, what sets this collection apart from many others I've seen is the fact that it's fairly paired down. True to Jane's modern, simple approach to design the book doesn't have any "filler" patterns. Each of the five patterns are truly unique, special and deserve a spot in the book. 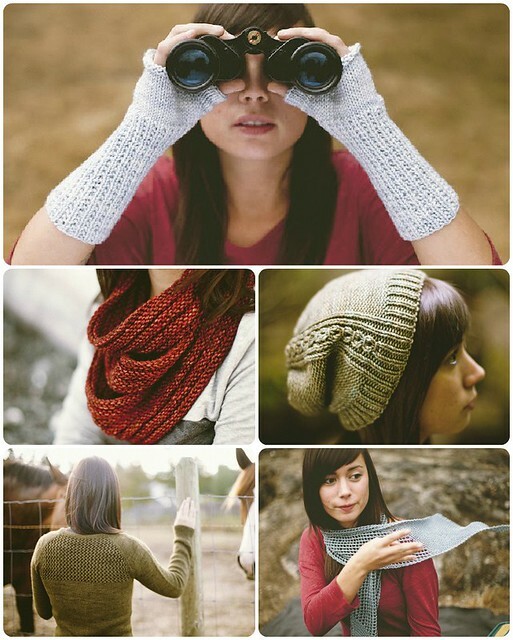 I would knit and love every one of these items, which is saying a lot! 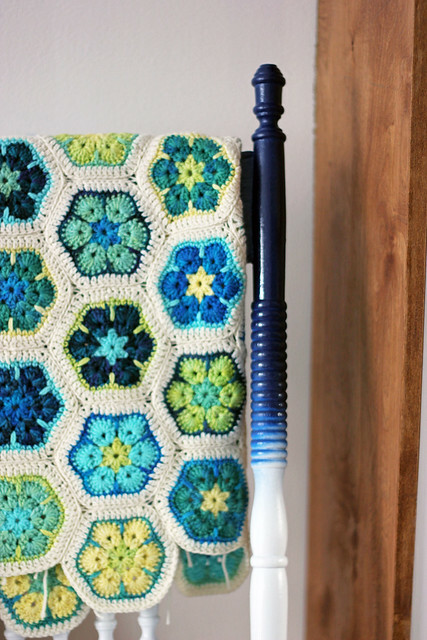 It's not easy to hit a home run with every pattern. My second favourite thing about the book is the fact that it comes in a beautifully printed hard copy format, a special item for you to flip through, enjoy and save. But, because Jane is clearly a common sense kinda gal, she's happy to provide digital copies of the patterns to knitters who can provide proof of purchase of the book. I think that is genius! I love holding the book in my hands, but it's also really nice to have a digital version that I can print out and write on, toss into my purse and not have to worry about. This thoughtful bonus means a lot to me. 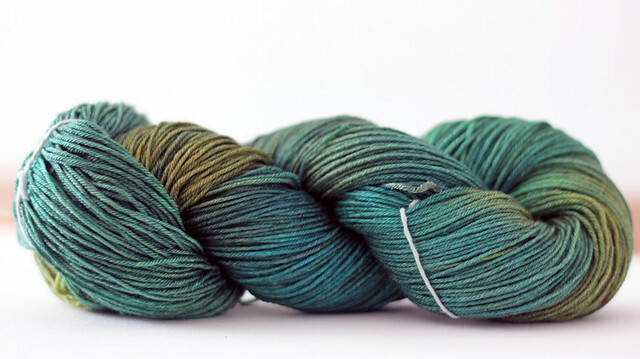 Though it's hard for me to pick a favourite, it was easy enough to chose the item that I was going to cast on for first: Strathcona! I just love the light and airy look, the casual drape, that point in the front! It's so clever. Because of the clever factor I came very close to casting on for an Arbutus Cowl as well, wouldn't it be amazing in Orange Label!? 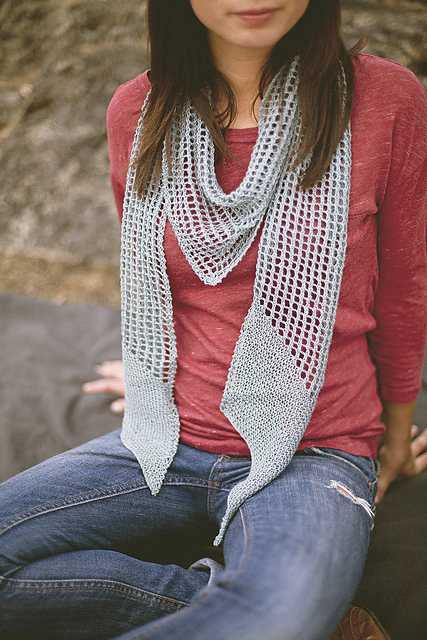 I'm sure there will be a few Arbutus Cowl's on my Christmas knitting list next year. Strathcona won out for me because I wanted a light, springy scarf and because I had this gorgeous skein of 75% merino, 25% silk that I had dyed in a colourway I'm calling "Almost Lucky Penny" (it's darker and greener than the final version). I'm making very good progress on my Strathcona Scarf, a marathon Oscar watching/scarf knitting night helped make a good dent in the knitting. Good luck! A winner will be announced on Friday March 1st. The perfect socks. :) 'nuff said. Just joking, I have a little bit more to say about these beauties, and it's all good! 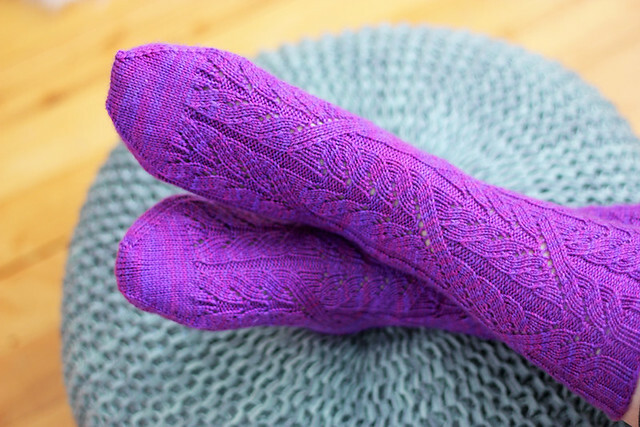 The pattern (Cadence Socks by VeryBusyMonkey) was fun to knit and very well written. 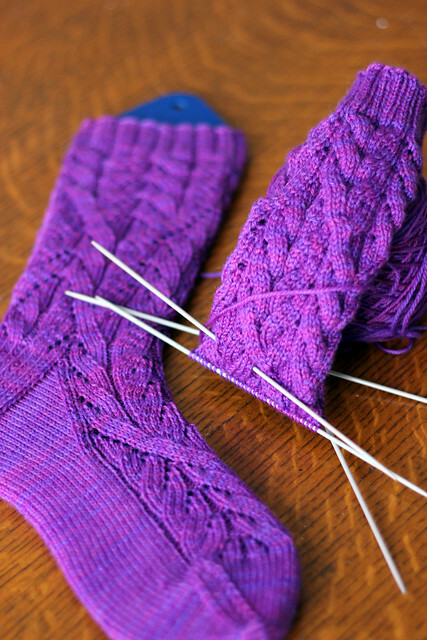 It was initially released as a mystery sock KAL, so the pattern is formatted in clues, which makes it really easy to follow. I knit my pair in my bright and saturated Jewel colourway. This pattern/yarn combo comes very highly recommended by me, in fact, my sister saw me working on these socks and liked them so much that she cast on for her own pair in the exact same colourway. Having bright toes really can be just the pick me up you need some days! I'm sure you've noticed that I have another FO to share with you (the awesome giant puff in the photo above!) I'll have more details to share about this bad boy soon. 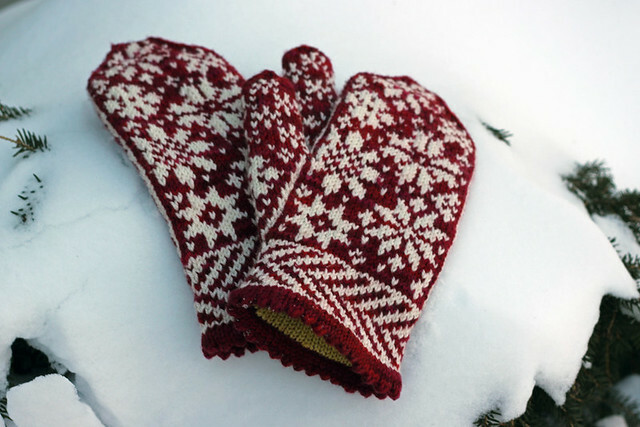 There was already a brief mention of my new Snowfling Mitten pattern in my last post, but I can't very well work for months on a new pattern that I developed into 4 colourways for kits and then just leave it at one tiny little blog mention. No way. 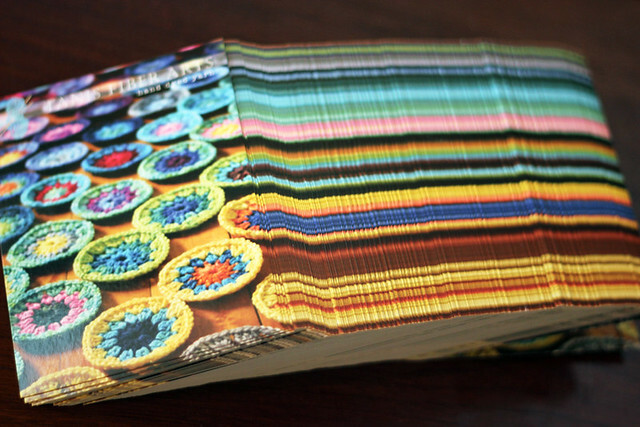 These mitts and the accompanying kits deserve their own post! So, here it is! The Snowfling Mitten pattern came to me completely out of nowhere. I was minding my own business back in November when I suddenly had the urge to knit myself a pair of mitts. 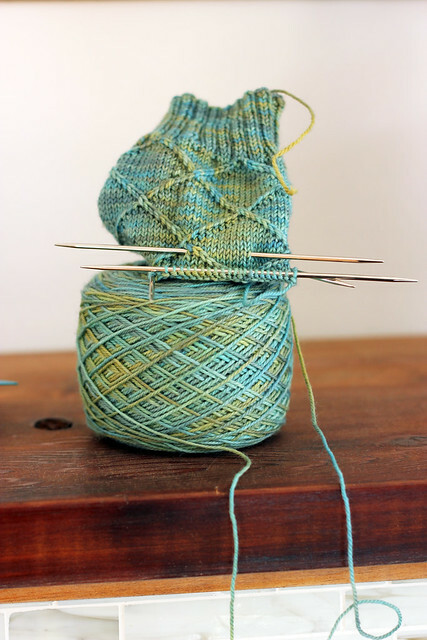 This kind of urge occurs frequently, the difference this time is that when the urge struck, I was conveniently hit with the perfect idea for the look of the mitts too. These two things don't always happen at once, I was lucky. I sat down at my computer and started charting out pretty snowflakes, then I made up a mitten template, scattered the snowflakes around and that was that! By that very evening I was knitting away happily on my first pair of Snowfling Mitts. It all came together like it was meant to be! From there, of course, came the tweaking. 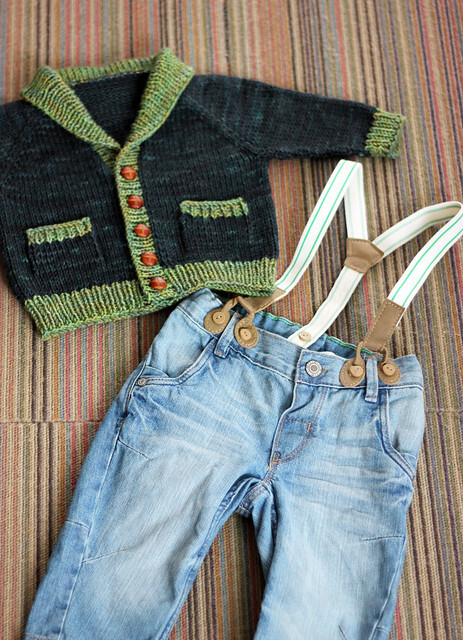 The official pattern drafting and test knitting and then finally the release of the pattern! So, what makes these mitts so awesome? Well, I happen to think that they are really very pretty, which is always nice in an accessory. But the real star? That pop of colour lining. 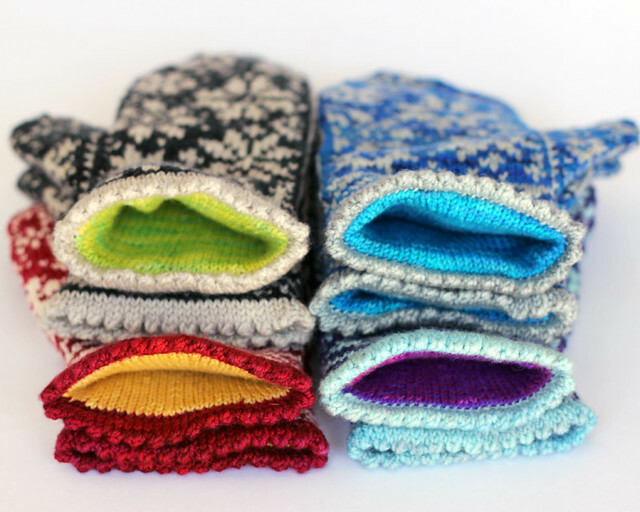 I just can't get enough of the bright, cheery, cashmere surprise inside these mitts. The cashmere lining is exceptionally soft, warm, beautiful and practical. Picking colour combo's to develop into kits was extremely easy and very difficult at the same time. The truth is, the colour possibilities are endless! 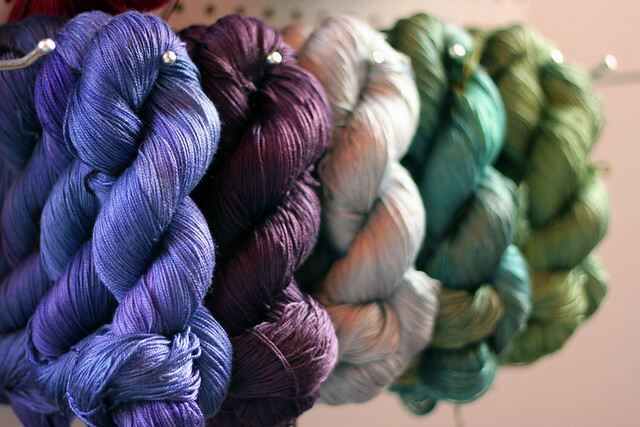 Any of my lighter colourways (Natural, Sand, Chris Grey) would look great paired with just about any of my other bolder shades. I opted to stick with a classic palette for these kits, a bold background colour with a light snowflake colour and then a bright lining, but you could definitely mix things up and do the reverse, or do a bright snowflake on a dark background (maybe Pink Grapefruit on a Charcoal background!) The sky's the limit! I had to share this little collage of photos from our photo shoot last weekend. We had a ton of snow so I was trying to use it creatively in our photos. All was going well until about 2 minutes into the shoot when I decided to throw the snow into the air and all over myself. The action shot was neat, but the resulting photos of me with white dust all over my curly hair and big belly made me look like I was playing a witch in a high school play... Not the look I was going for. Photo shoot - over. Snowfling Mitts ravelry pattern page here. Snowfling kits available on my website here. 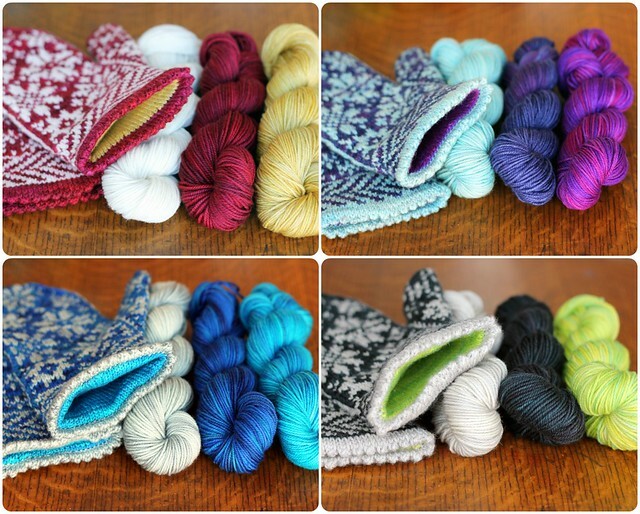 It's been a very busy week, but today I have these five beautiful new colourways to show for it! 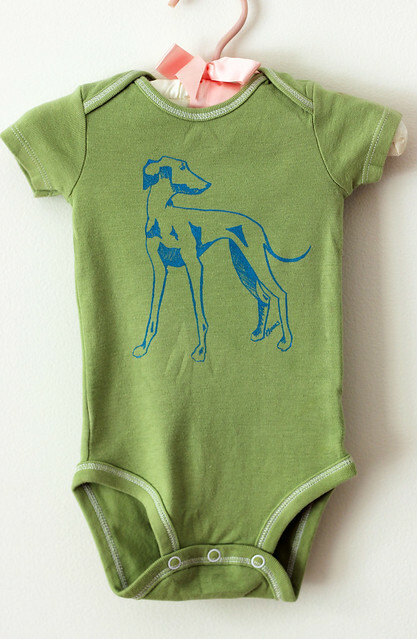 My new colours are now available in my shop. Enjoy! 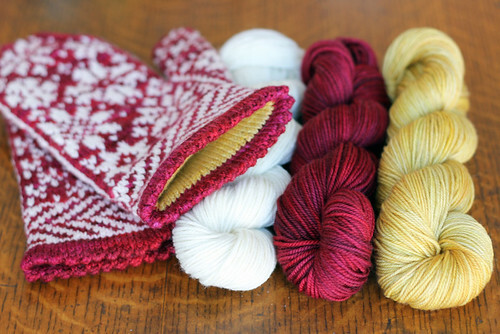 Bottom row: Lucky Penny and Snowfling Mitten Kits! 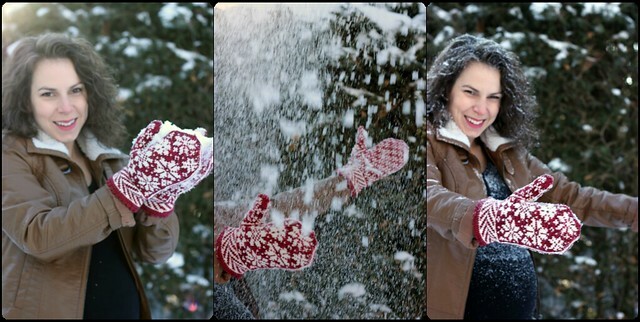 My Snowfling Mitten pattern is also ready for you! The pattern is available on my site here, or on ravelry here. 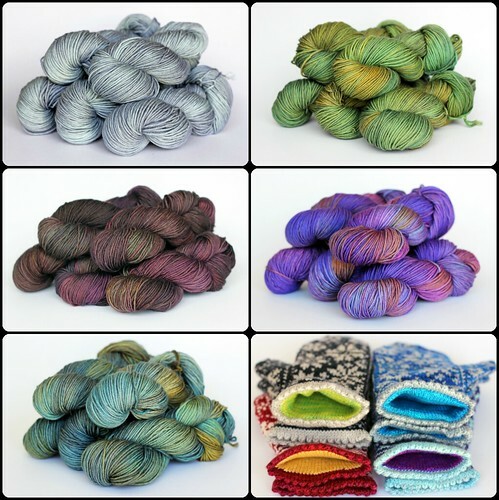 I've also made up a few kits for you to choose from! I'll be sharing more details about all of this exciting new stuff in the week ahead. Because baby can never have too many blankets I've cast on for yet another new project. This time a baby blanket design I'm working on in this bright and cheery colour palette inspired by some of the fabrics used in my nursery scheme. There are 2 new colourways in the photo above... can you spot them? Because I love it so, this Palette will likely be added to the Palette collection soon. Have a great weekend! 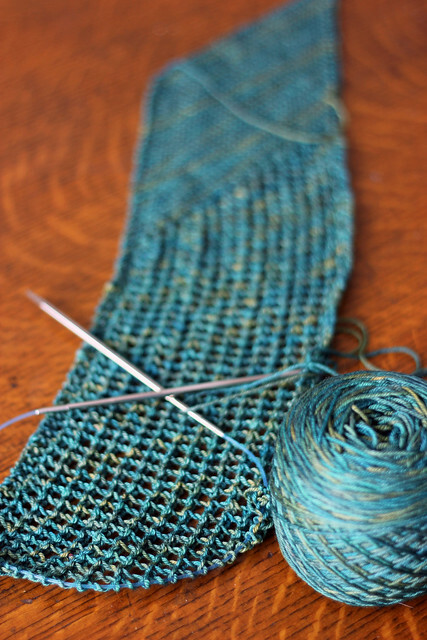 I managed to tear myself away from the socks long enough to start on this simple scarf that I intend to keep close by for my "brainless" knitting. Now that the pattern is well established it makes for perfect waiting room knitting. 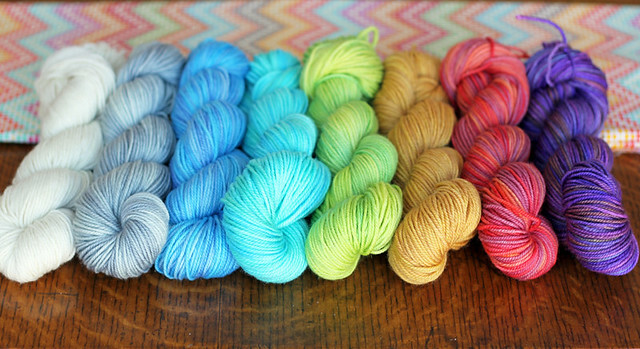 The yarn and colourway are both OOAK's. 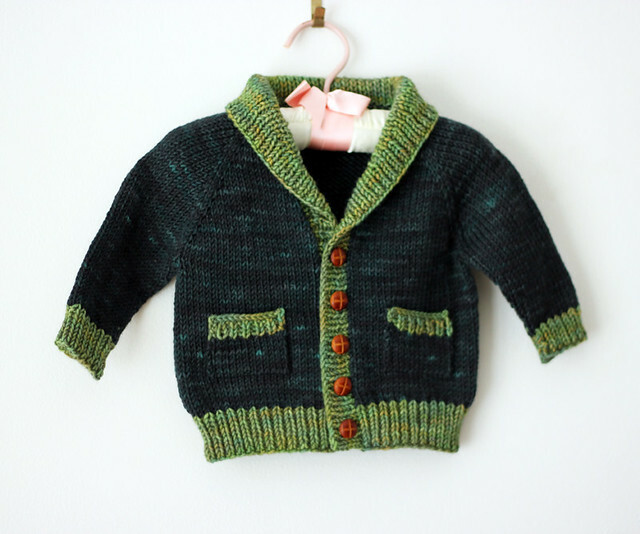 The pattern is Strathcona by Jane Richmond. Love it all. And just because variety is the spice of life I've thrown some crochet into the mix. 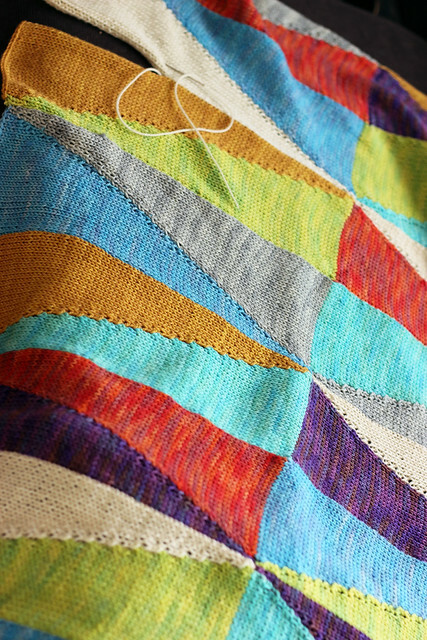 I haven't touched this baby blanket in months, but it's so close to being finished. I think that if I devote a few nights to working on it I'll have another blanket to add to my stack of baby knits.